Wolfin Membrane System has just been uncovered perfectly intact after 11 years of waterproofing planter boxes containing plants with extremely aggressive roots. In 2007 the Wolfin Membrane System was installed to over 10 000m2 on a large corporate facility located in Bella Vista. Wolfin was applied to various critical areas on the property including the planter boxes located inside the main offices. These planter boxes, waterproofed with Wolfin, have been in service for over 11 years & contain a growing medium that supports Bamboo plantings, which make this case study even more interesting. Before explaining further, here are a few facts about why Bamboo is an ideal plant for indoor office spaces and why it’s imperative to ensure correct membrane selection for these types of critical applications. Bamboo produces 35% more oxygen than trees which means it’s absorbs a lot more carbon dioxide and filter Formaldehyde & Xylene from the air. Bamboo can easily survive in low light conditions. Bamboo also transpire a litre of water a day, making them great natural humidifiers. However, Bamboo roots/rhizomes are renowned for penetrating & breaching waterproof membranes. This is due to their very aggressive roots which create runners that continually expand. They have been known to spread up to 5 metres in one year. Earlier this year, the owner of the building in Bella Vista decided to replace the plants & soils in two of these long-standing planters. The first step in doing so, was to completely empty & clean the boxes, to reveal the original Wolfin Membrane, which was found to be totally intact & unaffected. 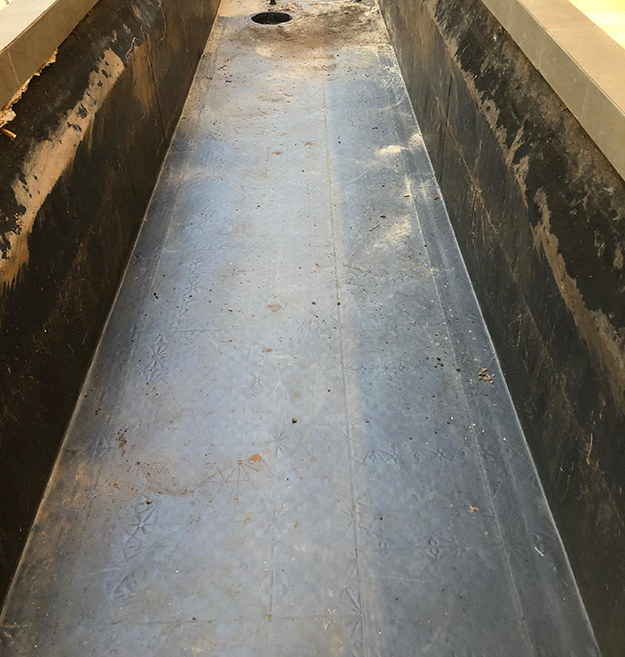 Prior to reinstating the soil, the building owner contacted Projex Group (distributor of Wolfin Waterproofing Systems) to re-inspect their membrane to confirm that it had not deteriorated, been damaged or punctured during the previous 11 years of service. On inspection, it was found that the Wolfin Membrane is still in excellent condition with no signs of deterioration or root damage. In fact, the roots have been forced to migrate upwards (as they could not penetrate the membrane) & can be seen working their way through the coping stone that sits atop of the planter box walls. The uncovered, undamaged and unpenetrated membrane can clearly be seen in the photograph. Wolfin Membranes are certified & tested to FLL Standards for resistance to root penetration, which makes Wolfin the ideal waterproofing solution for green roofs, planter boxes, landscaped podiums etc. If you are planning to build and waterproof planter boxes, green roofs or similar make sure you think long-term and choose the right waterproofing membrane for the application. Because making the wrong choice, could end up being a very costly and painful process. In this case study, the building owner has avoided the typical leakage problems associated with these installations including rectification costs to repair and/or replace the damaged membranes. They will continue to benefit for many years to come having installed Wolfin, the superior waterproofing membrane system.